Golf Business is the official publication of the National Golf Course Owners Association. The editorial content is designed to promote the exchange of information and ideas among course owners and senior industry executives to improve the profitability of their operations. Monthly articles cover all areas of management and operations, including course design and maintenance, pro shop merchandising, marketing and inventory control, food and beverage operations, insurance and liability issues, legislative updates, finance and human resources. Regular features include in-depth reviews of agronomic issues, environmental policies, technology, highlights of new golf course equipment, plus merchandising strategies for golf apparel, equipment and accessories. 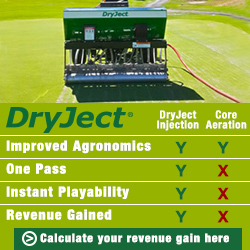 Golf Business is dedicated to serving the entire interest of the golf course operation. Although Golf Business is technically an association publication designed to increase the visibility of the NGCOA and golf course owners, the magazine has achieved a leadership position within the golf industry. The magazine goes to the leaders of all golf courses-not just member courses-so it is much more than an association publication. Golf Business is an industry magazine. As such, we must labor-at all costs-to preserve the editorial integrity of our magazine because operators look to Golf Business for unbiased, real-world solutions for ways to run their businesses more efficiently and profitably. To ensure we deliver on our editorial mission, Golf Business does not publish "articles" submitted from golf industry vendors or equipment manufacturers because the content of these pieces is inherently skewed to benefit a person, product, event or issue represented by the submitting party. If you feel that your company provides a service or product that would be of interest to our readers-one that is designed to help golf course operators run their businesses more profitably or efficiently-you are welcome to pitch the idea to the editor. However, doing so does not indicate a promise or intent to profile the company/product; rather, it means the editor will simply review the pitch. If the editor determines a person, product or service is worthy to be profiled in Golf Business, he will commission a freelance writer to interview sources and write the story. Please note, however, that all articles will be written from the course operator's perspective. For instance, instead of a story on how Acme Industries has a new GPS product and all of the wonderful things it can do, the story would be positioned as how Joe Golf Course Owner utilized a new GPS technology to streamline the way he manages his course's turf. It would focus on: why that particular technology was chosen, how it was applied, cost of implementation, any challenges encountered and how they were overcome, and ROI. Any mention of a particular company and/or product will be secondary and only occur once within the story. The focus of the article will be the operator's problem and the solution. That said, it is in the interest of vendors/manufacturers to present any operators who have used their product to solve a particular problem or improve a certain area within his/her golf course operation. Doing so highlights owner/operators who exhibit "best practices" in their operations and, to a lesser degree, associates the vendor/manufacturer with some of the industry's most progressive and innovative operators. Questions? Contact Ronnie Musselwhite, editor, at 843-881-9956, ext. 224 or rmusselwhite@ngcoa.org.